Pho is a classic Vietnamese soup that's packed full of complex Eastern flavors. Traditionally it's made with various cuts of beef boiled in an aromatic broth containing cinnamon, cloves, fennel, star anise, ginger and charred onions. The resulting flavors create a perfect blend of sweet, savory, spicy, meat-y and herbacious notes that work beautifully together. This sandwich recipe, inspired by the infamous Pho #1 sub from Sunny and Annie's Deli in the East Village of New York City, packs all of those distinctive flavors into one perfectly portable sandwich. And who doesn't like pho on the go? When making this sandwich, you'll see in the directions below that there are two different ways that you can serve it -- hot or cold. They are both totally mind blowing but we at The Spruce always say hot all day! And if you're a vegetarian, skip the beef and add extra avocado or smokey grilled tofu with hoisin sauce. Begin by slicing your baguette in half. Place the bread in the center of a large sheet of parchment paper. Smear one side with Sriracha and place the onions on the other side. Add tomatoes and avocado to the Sriracha side and add the sprouts to the red onion side. If you want the sandwich served cold, place the roast beef on top of the of the tomatoes and drizzle with all of the hoisin sauce. If you want the sandwich served hot, roughly chop the roast beef and throw it in a nonstick pan over medium-high heat. Let the roast beef cook for about 5 minutes or until it begins to brown and crisp up. Add in the hoisin sauce and toss to coat. Add the roast beef on top of the tomato/avocado side and top with cilantro and basil. Carefully fold the sandwich together and tightly roll the sandwich in the parchment paper, tucking the sides underneath. Using a serrated knife, slice the sandwich down the middle. Either bake the sandwich at 375 for 15 minutes if you want it hot or serve it immediately if you want it cold. 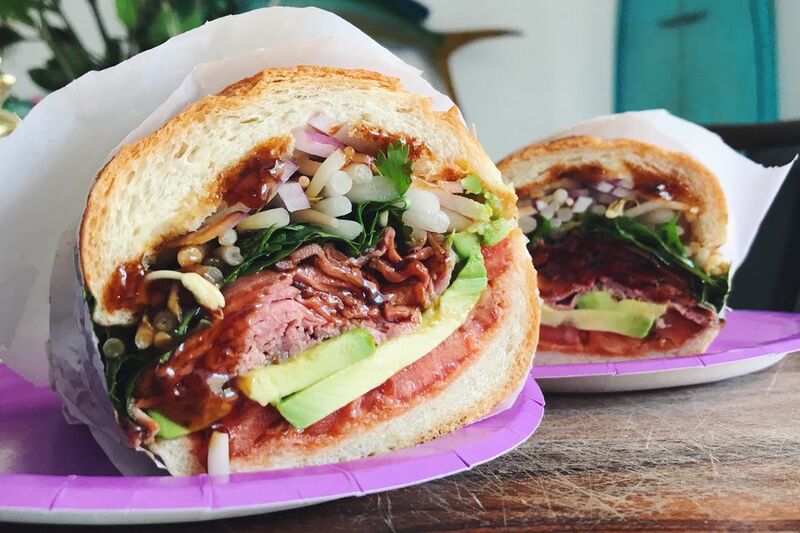 Try these 5 Buzzworthy NYC Sandwiches while they're hot!